Although I would have preferred to have told you about this product this winter, still it's an interesting product that holds promise for both health care and just plain keeping your hands warm. 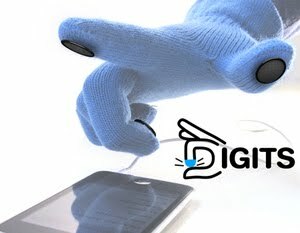 Digits allow you to use touchscreen devices without having to remove your gloves. - Pin the Digit to one (or several) of your glove’s tips. - The Digit pierces the glove, making direct contact with your finger. - This connection carries a small amount of electricity through the metal backing to the Digit’s face, which is made of conductive fabric. - The conductive fabric triggers the mechanism on the touch screen. Of course this isn't going to work in a health care environment where the gloves cannot have holes in them. Still, I can see in the future some type of conduction to pass through the latex or nitrile.